‘Tamanna’ is the same old clichéd female centric story that is common in many rural areas of India with a fresh perspective by a very talented writer/director. It speaks of the transformation of a young girl form the rural interiors to the new empowered women by virtue of her education in the city who fights against the oppression (or rather the lack of free will to women ) of women in the society. It’s also a journey of self-discovery for the lead protagonist Tamanna (Played by Anvita). The plot has various flashback and real time scenes happening one after the other which is lucidly explained in the script. Subhanshuk (Hawaldar) and Mayank(Inspector) do great in their parts. Subhanshu uses the rural accent to suit the plot and does commendable world in his sly humor and body language (talk about getting into the character). Bhavna (Tammana’s mother) efficiently essays a typical Punjabi mother who is proud of her daughter’s success and wants to get rid of her responsibility by marrying her daughter. Vicky (played by Vivek) is show as a naïve brother at the start (which seemed a little too childish) but transfers into a strong character when he realizes his sister is actually in love with a guy-Ashish (Ekansh) from her college. Pikai (Ashish’s father) and Ashish (both do due justice to their roles) patiently try to convince the girl family for the marriage and the scene convincingly portrays the disregard of Love marriages in the rural Indian Society. Eventually the couple does get married. A better portrayal of a romantic husband would have worked wonders in the anniversary scene. The argument scene seemed to go out of hand a little bit. It could have been much better with clarity of dialogues. Vivek And his associate decide it time to get even with Ashish and eventually kill Ashish. The gem of the story is Tammana who comes out as a strong independent woman trying to fight against the society for her love. She maintains her calm during the whole ordeal and speaks up against her Husband’s killers silencing them while standing up for the right. Anvita does complete justice to her role with sublime acting and is bound to do great in future with polishing from Fourth Wall. Lastly, The well written script and great direction from Surabhi along with insightful narration greatly adds value to the play. On the whole it was a great effort by the whole cast and Mentors (Prasun and Tanash ) and a great time for the audience . Fourth Wall seems to have a gem in Surabhi with her overall effort in the play and I am confident that she is bound to achieve great success in direction/script writing in Fourth Wall. All the best to all the sophomores who put a great show and may your contribute hugely to the club and enrich it even further. This entry was posted in Home, Institute Plays, Reviews. Bookmark the permalink. 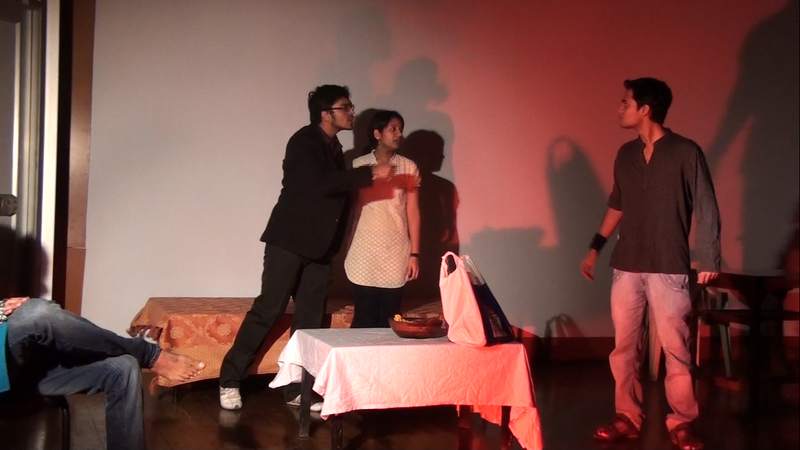 TheatreFest-2012 – Back with a Bang !